Although often referred to as "Antibes Juan les Pins", Juan les Pins is in fact a separate entity, being the beach resort adjoining the historic town of Antibes. Juan les Pins may not be able to offer the history and culture of its illustrious neighbour, but it is justly famed for its superb beaches (among the best on the Côte d'Azur) and for its nightclubs that act as a magnet for the coolest revellers in Europe! Scott Fitzgerald referred to it as a 'constant carnival' and the phrase holds true today. A 'must see' in Juan les Pins is The Pinede with its beautiful sandy beaches framed by the pine trees from which the resort gained its name. 'Pinede' means 'pine grove' and these very pine groves once echoed to the sounds of the hedonistic parties of the 'roaring twenties' frequented by none other than Rudolph Valentino. The beaches are perfect for swimming and on summer evenings they are frequently packed with diners enjoying the warm climate and the lovely setting. The Juan les Pins jazz festival is famed throughout the music world and has attracted some of the best-known stars of the genre since its inception in 1960. The festival is held every year in the Pinede. 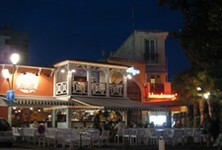 Juan les Pins' links with jazz are illustrated by the fact that the town is now twinned with the French quarter of New Orleans. The beginnings of Juan les Pins were very different from the lively resort we know today. It was notable only for pine trees and sandy beaches, but the combination appealed to two men who spotted its potential and whose vision (not to mention money) laid the foundations for its success. These man were Edouard Boudain, who revamped a failing casino and attracted crowds with cabaret acts such as 'The Dolly Sisters', and the wealthy and notorious American, Frank Jay Gould, whose influence and investment is credited with putting Juan les Pins well and truly on the map for the international jet set. Air travel couldn't be easier as Nice Airport has a choice of airlines flying direct from the UK. Rail links are also good with trains to Nice and Aix en Provence and Antibes. Property is expensive here and you are more likely to find an apartment or a villa than a farmhouse with acres of land! The location though is superb with many properties overlooking the coast. Prices are generally high on the Côte d'Azur and expect to pay a premium for property with the prestigious Juan les Pins address. Do you know Antibes Juan Les Pins better than we do? Do you have photos of Antibes Juan Les Pins? WHERE IS Antibes Juan Les Pins? Juan les Pins is situated between Cannes and Nice on the Mediterranean coast close to Antibes in the department of Alpes Maritimes (06). Access: Air links from the UK to Nice International Airport with airlines including easyJet, BA, Flybe and British Midlands. Rail travel to Nice with Rail Europe. TGV service from Paris to Antibes and from Aix en Provence. Economy: Almost exclusively tourism and leisure. Interesting fact: Juan les Pins is mentioned in Peter Sarstedt's well known song 'Where Do You Go To, My Lovely'.